Complying with the Americans with Disabilities Act needn’t break the bank and may be as simple as doing what you are already good at. Take five parts hospitality, one part research, two parts active listening, and add a dash of compassion to create a salon that’s accessible to all. Mention the Americans with Disabilities Act and small business owners start to get nervous. It has nothing to do with the desire to be accommodating and everything to do with the great unknown. Some start to conjure up ideas of exhaustive remodeling and emptied bank accounts; others are just overwhelmed and aren’t sure where to begin. As salon owners, employees, and booth renters, you have a unique perspective. Quite likely, you have been accommodating persons with disabilities all along … and doing a pretty good job with few resources. Since no exhaustive, all-inclusive list exists, we’ll consider this a work-in-progress — one accessible parking space at a time. As the world’s largest law office, the Department of Justice is tasked with most issues of Americans with Disabilities Act compliance. And while they have set up the voluntary ADA Mediation Program to guide the resolution of complaints, it’s far better for all involved to reduce the number of complaints through reasonable efforts to make our businesses accessible and enjoyable to those with obvious or hidden disabilities. According to the 2006 U.S. Census data, over 41 million Americans over the age of 5 are living with a disability. That’s 15.1% of the population. Chances are good that some of our clients or employees are struggling with a disability, perhaps even without you knowing about it. While we can’t ignore the legalese set forth by the law, it’s best left to the attorneys and courts to interpret. What we can do is open up our minds and our hearts to making life a bit better for those around us. Some of our best guides may very well be the persons with disabilities whom we serve on a daily basis. In a salon setting, the true nature of hospitality dictates that we do everything we can to make clients comfortable. Technicians have been known to go way beyond the call of duty. It could be that all clients are just a bit (if only momentarily) disabled by freshly painted fingernails, or that we get into this business because of the difference we make in people’s lives. Either way, the spirit of the law is that we do all that is reasonable to make our businesses accessible to patrons and employees alike. Teri Barker-Morgan, sponsored programs manager for the Virginia Board for People with Disabilities, shares that salons can “become more compliant by contacting their local Center for Independent Living for guidance. 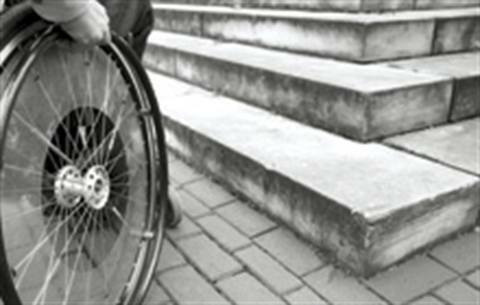 The Centers have resources that include community education and awareness.” She also suggests exploring disability etiquette as a first line education response for salons. >When communicating with a person with a disability, speak directly to them. Avoid speaking to the aid, companion, or interpreter. >If you offer assistance, wait for a response and allow the person to give direction regarding their needs. >Try to be at eye level when communicating (for more than brief periods) with someone in a wheelchair. >Allow service dogs to do their job. Do not pet, play with, or distract the animal. >If a person is deaf or hard of hearing, do not shout at them. Allow them to see your face and direct you to their needs. >Don’t make the disability a topic of conversation. >Treat persons with disabilities as you would others in the group. Extend the same invitations and let them direct their needs when accepting the invitation. >If your salon has special assistive measures in place, such as interpreters, wheelchair-friendly areas, special parking, etc., list them on your website. Encourage patrons to let you know how you can be of assistance.